Seven workers either lost consciousness or became confused while trying to rescue one another in an oxygen-deficient confined space. Luckily, they experienced only minor injuries. However, this incident could have been fatal. 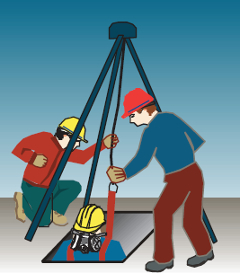 Too often, workers don't recognize the dangers of a confined space. Is enclosed or partially enclosed. Is not designed or intended for continuous human occupancy. Is, or may become, hazardous because of its design, location, construction, atmosphere, the materials in it or other factors. About 60% of deaths in confined spaces result from oxygen deficiency and lack of air quality testing. More than half of those who died in confined spaces did so while trying to rescue fellow workers. There are four main dangers in confined spaces: oxygen deficiency or enrichment, fire or explosion, toxicity, and drowning in liquids or free-flowing solids. If the results of the tests show the atmosphere may be harmful or flammable, purging and ventilating needs to be conducted. Purging consists of displacing the existing atmosphere with agents such as air, nitrogen, water or steam. Air contaminants can also be removed, and oxygen levels corrected, by mechanical ventilation. Three people are required at the site of a confined space entry: the entrant, a person standing at the entrance, and a back-up employee within sight and shouting distance with no obstructions or barriers to overcome in order to reach the space (for example, not in another room or a parking lot). Each has to be properly trained to carry out their responsibilities. Workers exposed to hazards in a confined space must be protected from injury by PPE. A competent person must, in a written report, identify the protective equipment that is to be used. The employer must ensure that all protective equipment has been inspected by a competent person, is in good working order and that employees comply to the legislation by wearing the required PPE. Also, where identified by the competent person, each entrant must wear a full-body harness attached to a lifeline that is attached to a secured anchor outside the confined space. If the entry hole is very small, wrist cuffs may be necessary. Confined spaces often make talking difficult because of noise, distance, PPE, lighting, etc. Special equipment and techniques, such as radio, microphones, hand signals and flags, must be in place to allow communication among all personnel involved with the work. Any confined space entry shall comply with the Occupational Health and Safety Act, General Regulation 91-191, Part XVII - Confined Space, sections 262-272.